October 13, 2018 by Anne Sangemino – Comments? These well known ingredients , Aloe Vera, Witch Hazel, Lavender and Chamomile Essential Oils have powerful, yet gentle detoxifying effects for your complexion. say goodbye to clogged pores; watch your complicated complexion become clear. Mist your face after cleansing your complexion. Let it absorb to penetrate the pores. Skincare Guardian’s Clear Complexion Toner is a multi-purpose blend of whole plant extracts designed to sooth, cleanse and nurture all skin types. Aloe Vera Juice: Active constituents, the guardians for a clear complexion are inulin and allantoin. Inulin is a mucilage which coats the skin and sooths inflammation and cleanses clogged pores. Allantoin proliferates new skin growth and protects the skin from scarring, tightens the pores, and a rutty complexion. Witch Hazel: For centuries, it is credited with anti-inflammatory and astringent qualities, plus it contains softening and emollient properties. It repairs ruptured skin, disperses fluids which build up in pimples and effectively dries up complicated outbreaks on the complexion. It also counters the damaging effects from the sun, the anti-free radical guardian absorbs the dangerous side effects the sun may cause. Lavender Essential Oil: Is credited with many therapeutic effects, anti-inflammatory, antiseptic, antibacterial, soothing, balancing, and regulates skin functions. Beneficial for all skin types while producing excellent results on oily skin complexion flare ups. It is useful for sunburns, dermatitis, eczema, and psoriasis. The guardian, stimulates cellular growth and regeneration of new skin. 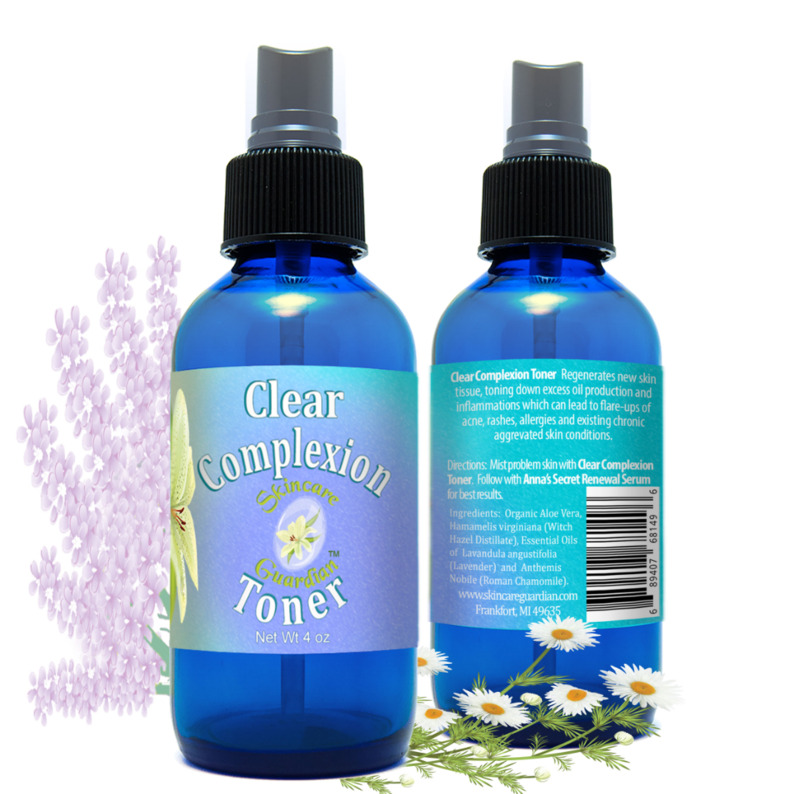 Chamomile Essential Oil: It is an antiseptic and emollient with the ability to neutralize skin irritants. It has a clean purifying effect for soothing the complexion. The guardian nurtures all skin disorders and has been found nurturing to burns and skin inflammations as well as dermatitis. There are so many choices for skin care on the market which range in price. The marketing hype, 'You get what you pay for' is not truthful. I have researched natural ingredients, isolated compounds which are blended to alter the active constituents; in hope they will do what the chemists want them to do with long range harm. In reality, natural ingredients are extracts made from whole plants, blended and designed for your health and vibrant beauty in mind. The virtue of whole plant extracts is the affinity and synergistic vitality plants store for efficient absorption for health and beauty. Skincare Guardian offers a supernatural delivery system from the guardian within each plant for healthy skin benefits and beautiful vibrant skin. I am interested in designing skincare products that make you feel good and are healthy for you to use, so your vitality will glow from within. Healthy beauty is feeling good about yourself. For, 40 years I have been designing skincare products with whole plant, botanical extracts. Grown in my gardens in organic soil, and preserving my fresh harvest for Skincare Products, using whole plants for whole People to nurture healthy beauty and a holistic lifestyle. I am sharing my labor on love, in my belief of the Creator's purpose and intention; the nurturing affinity of plants for the vibrant vitality of people. To live healthy and enjoy a radiant lifestyle with a youthful beautiful glow. Less is more. Trusting my body and working in harmony with the natural cycle and process of my body has proven to work best. You have lived a long and rich life. Your face tells a wonderful story. Why hide it?"